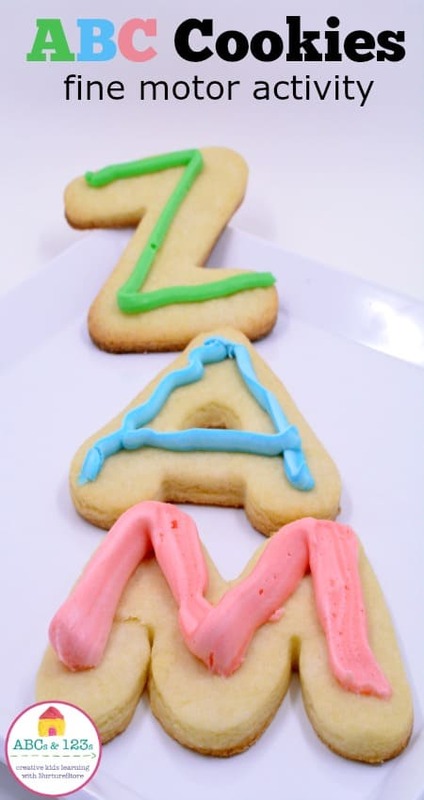 This easy cookie recipe for children is a really fun way to introduce the alphabet to preschoolers. Joining us today is Jodie from Growing Book by Book showing us how to bake a yummy alphabet as part of our ABCs and 123s series for letter and math activities. Having two preschoolers in the house means we do a lot of hands-on playful activities to work on learning our letters and sounds. One of our favorite activities, that is full of learning opportunities, is baking together. We are so excited to share our ABC Cookies with you today. 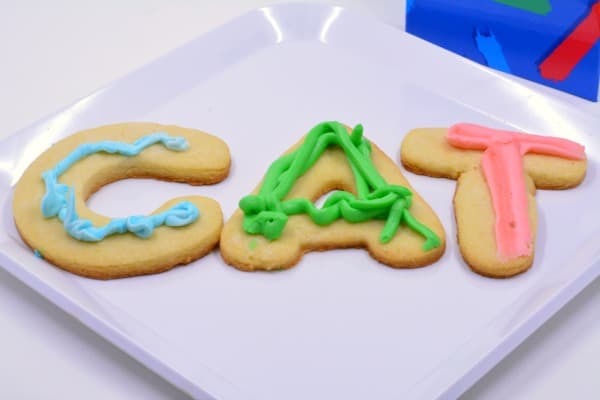 This cookie baking experience includes the following literacy benefits: letter recognition, following directions, letter/sound relationships, and fine motor strengthening. To get started you will need a set of alphabet cookie cutters, your favorite sugar cookie recipe (this is our favorite) and your preferred frosting recipe. We made a buttercream frosting with 1 stick of butter (softened), 16 oz. powdered sugar, 1/2 tsp. vanilla and 1 TBSP milk. Blend in a mixer until light and fluffy. Divide into small bowls and use food dye to color. Spread out the cookie cutters and work on a little letter identification. You might have your child place the letters in ABC order. Mix up your cookie dough with your child. Give the child one direction to follow at a time. I find it helpful to have all the ingredients organized before we start when working with small children. Many sugar cookie dough recipes will require you to refrigerate the dough for a few hours before rolling and baking. 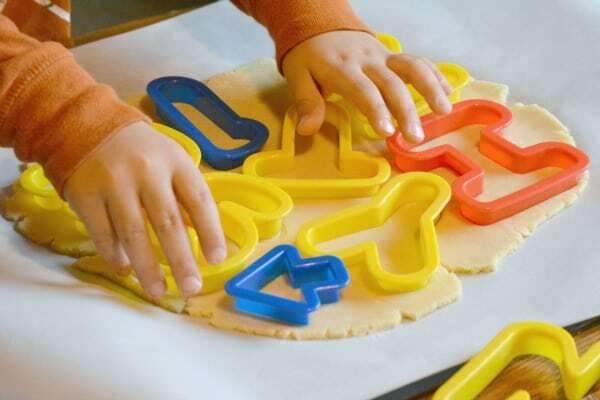 Roll out the cookie dough and allow your child to use the cookie cutters to make the letter shapes. Transfer to a cooking sheet and bake. While the cookies bake and cool, have your child wash the cookie cutters and identify the letters again for more practice. Extend the learning and have your child name a word that begins with each letter sound. Place each color of frosting into a small zip topped sandwich bag. Snip a small cut in one corner of each bag so that your child will be able to pipe the frosting. Piping the frosting is wonderful for strengthening muscles in our child’s hand which is important for helping your child have enough hand control to write. When the cookies have cooled, it’s time to write. Write with frosting that is! 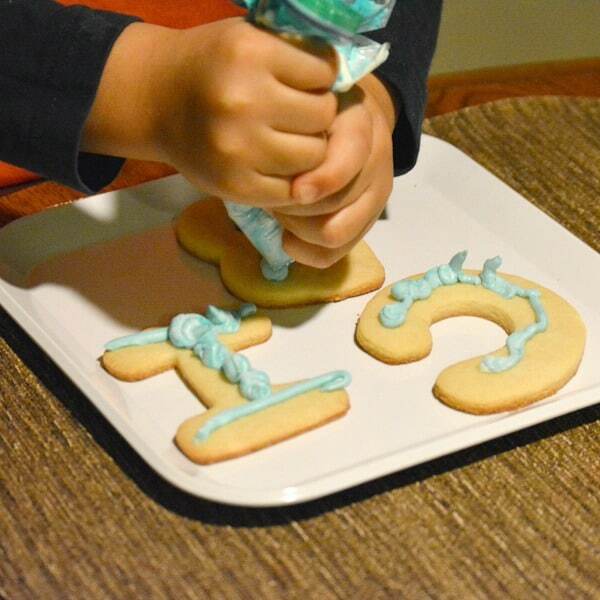 Let your child trace the shape of each letter with the frosting bags. You could also extend the learning by letting the kids build simple words with them and then practice reading the words.. We built some short cvc words such as cat, ham, and dog. For more hands-on alphabet activities, check out my 8 Magnetic Letter Alphabet Games, How to Teach the Alphabet and Alphabet Games and Activities. Jodie Rodriguez has a passion for helping caregivers nurture our youngest readers. As a former National Board Certified early-childhood teacher and administrator, she has worked with thousands of families and educators providing best literacy practices. Connect with Jodie: Growing Book by Book, Facebook , Instagram and Pinterest.